Doing the Cheeky Walks has introduced me to several amazing places I should have visited during my two decades in Brighton. 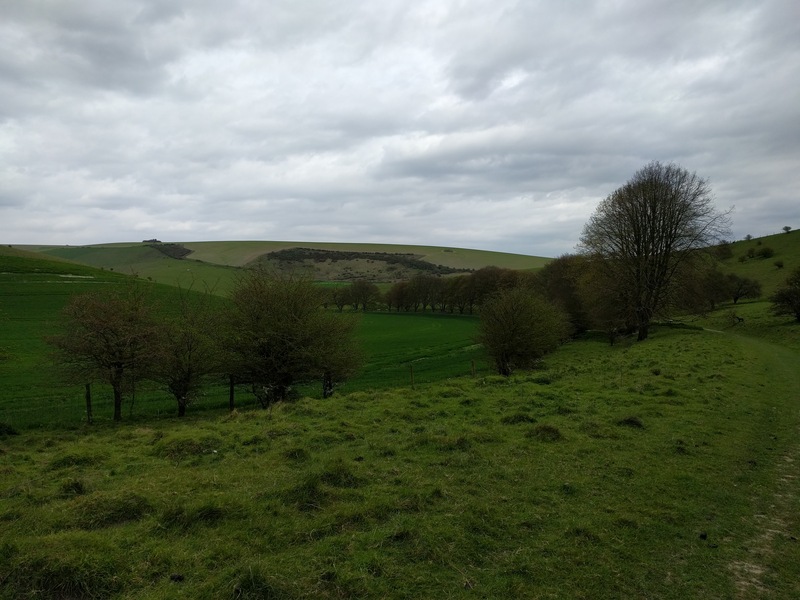 I’ve found stunning countryside a short distance away and walked along Devil’s Dyke for the first time. 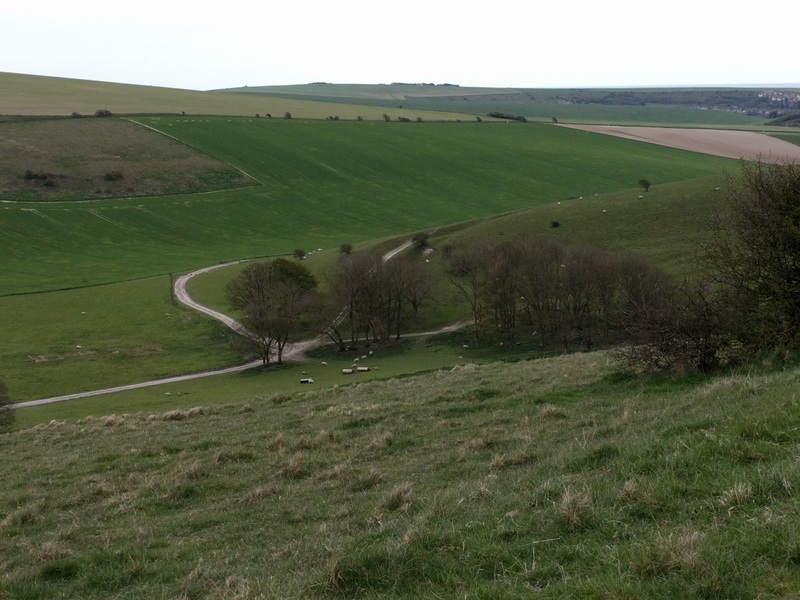 But Sunday’s trip to the Castle Hill Nature Reserve was the best discovery so far, and I had no idea it existed. David Thoreau warned his readers to “beware of all enterprises that require new clothes”. 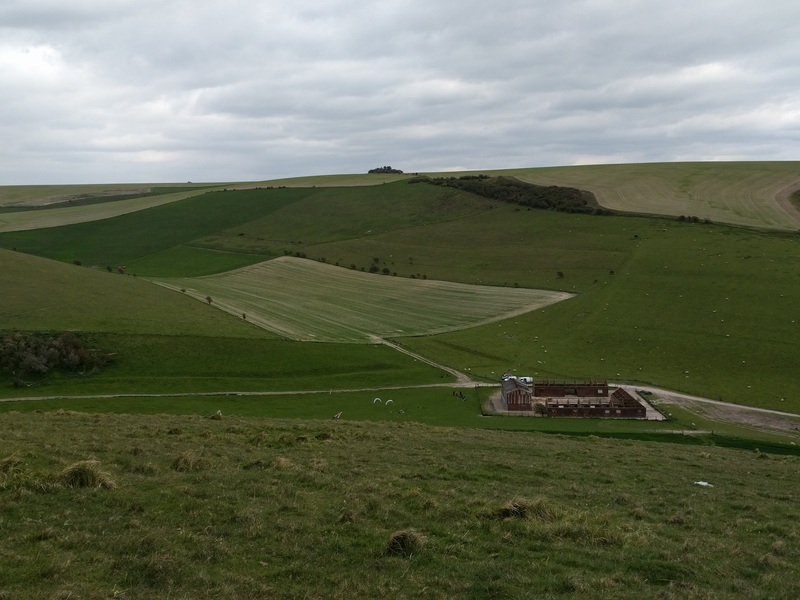 The Cheeky Walk around Castle Hill and the Lost Village of Balsdean required a new piece of equipment and a CD. The disc, 1 inch/ ½ mile by Grasscut is intended to be listened to at various points along the walk. I also bought a headphone splitter so that Lela and I could listen to the soundtrack simultaneously. And, in a departure from Cheeky Guide protocol, the walk is accompanied by a map. 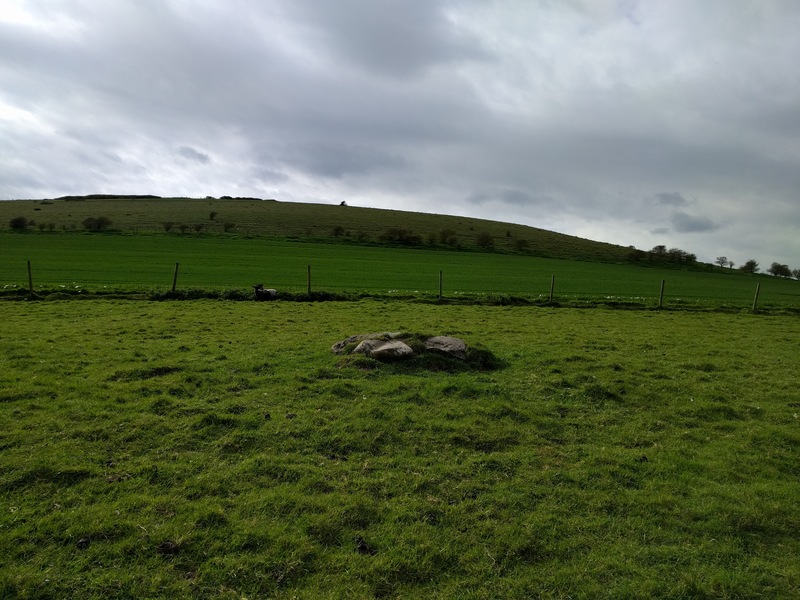 Balsdean dates back to the 12th century and was a small farming community. For a time the manor house was used for a mental hospital. It fell into disrepair and the few remaining residents were removed in the second world war. 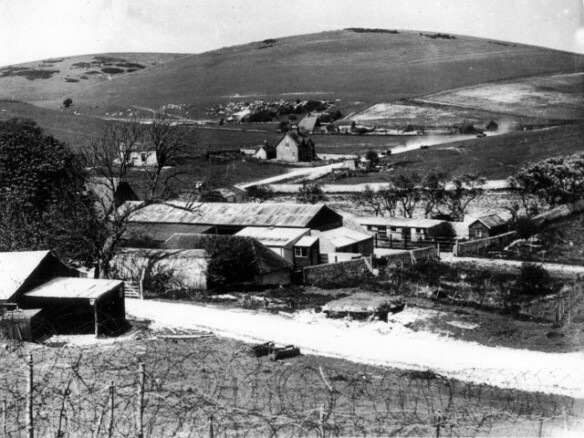 The village was then used for artillery practise. Little trace of the buildings remain. Even online it’s hard to find photographs of what it once looked like. Listening to a soundtrack on a walk was an interesting innovation. Some tracks worked better than others (I caught Lela removing her headphones during one of the noisier, glitchier tracks). On the whole, it did enhance the walk, particularly when wind whistled around the headphones. I’d not heard of Grasscut before, but they seem to be an interesting band. 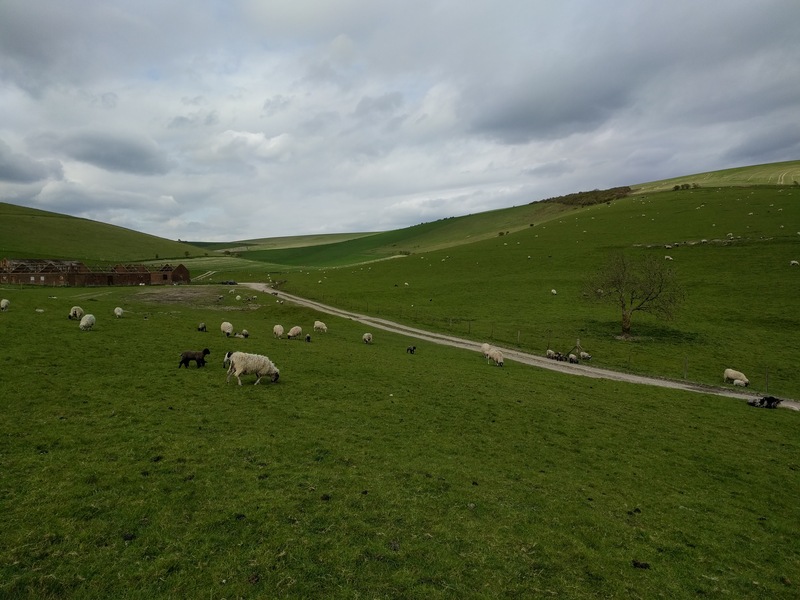 The scenery here was stunning, a long right-angled valley with derelict farm buildings in the middle. 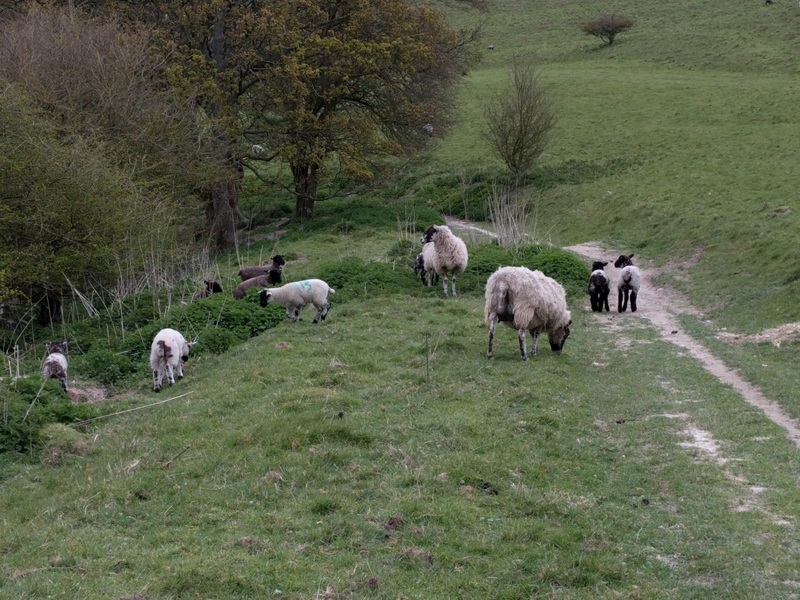 There were also fearless lambs coming up to say hello as we walked down the avenue of trees. 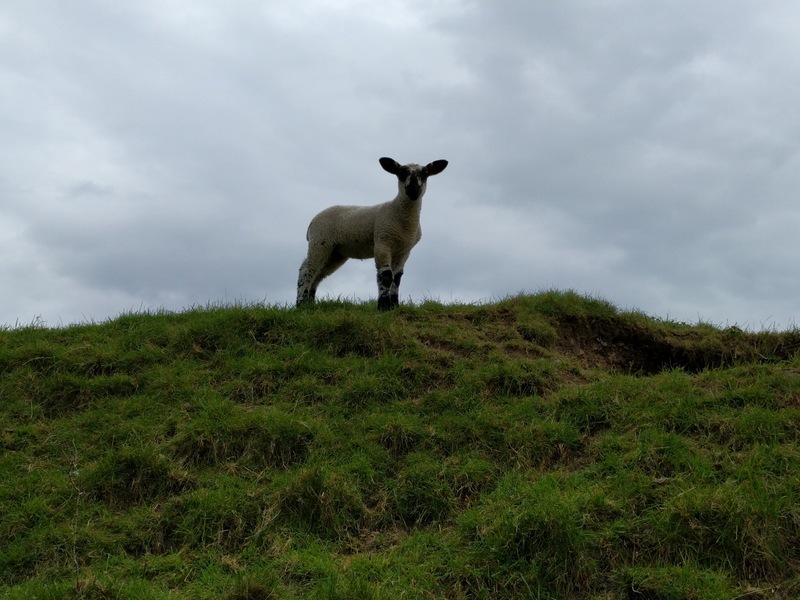 A few weeks ago, we’d passed Saddlescomb Farm while the lambing was taking place; now there were young lambs out in the field. I like how the countryside can tell stories like that between walks. 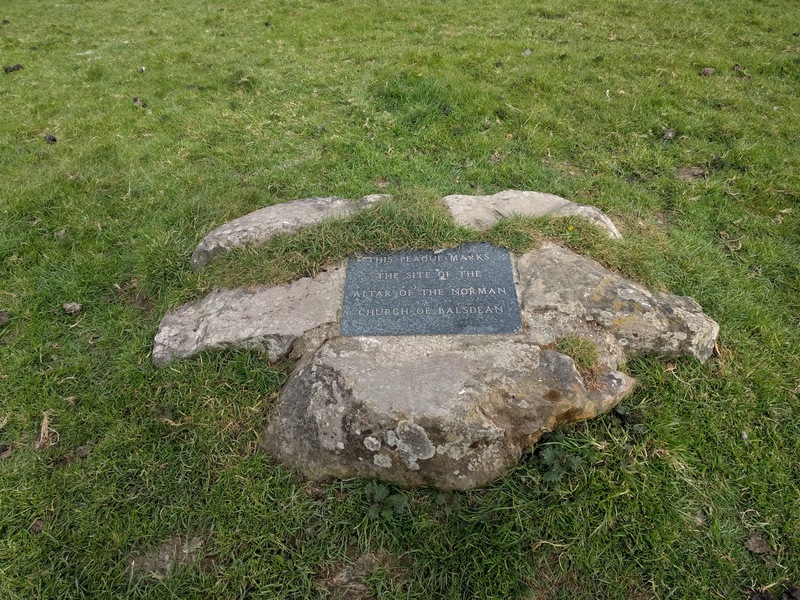 The only traces of the old village are some half-buried foundations, and a plaque left where the church’s altar once was. It seems a shame to have used a Norman church for target practise. As we walked along the valley we occasionally heard screaming noises. Sometimes they sounded almost human. They had to be something to do with the flags near the derelict farm buildings. On our way back through the bottom of the valley we found that the noises were drone racers, from the Hidden Valley Group. Four of them were flying, piles of battery-packs beside their chairs – a drone can only fly a few minutes on a charge. Even so, when the racing is going on it looks exhilarating and the manoeuvrability is amazing. You can see examples on sites like FliteTest or RotorRiot . We stopped to talk with Ed, one of the racers. We also got to have a look at the viewscreens – the drones fly with cameras, allowing the pilots to fly with a first-person view. 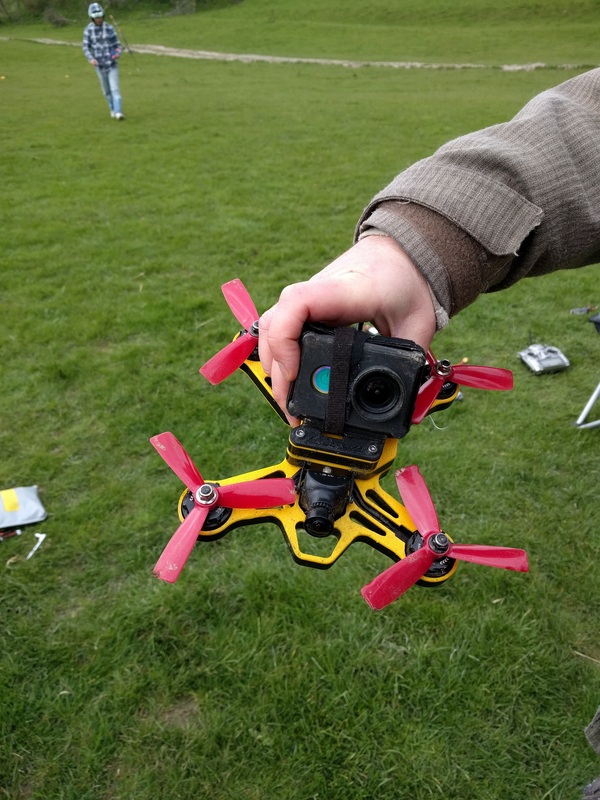 The drone racers told us about an air-show and drone-racing competition coming in early may. After talking to the racers we were faced with the climb out of the valley. 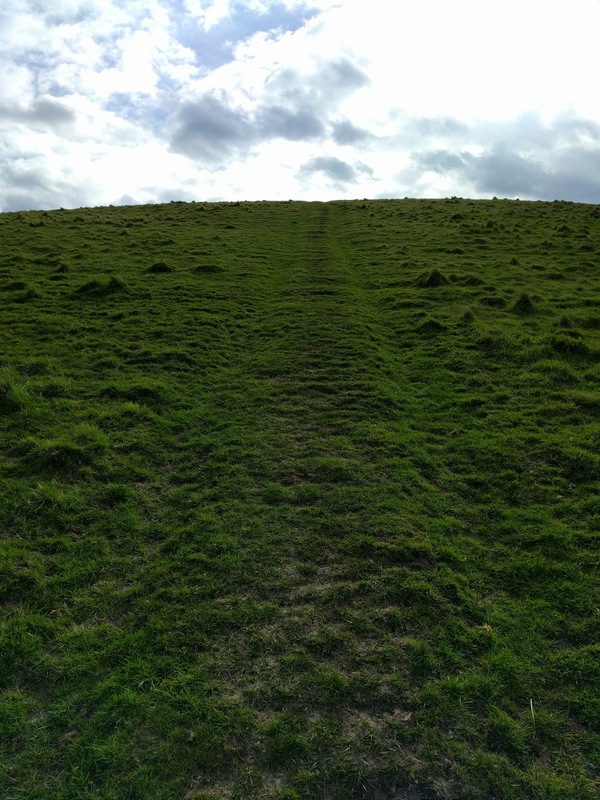 I’ve encountered a fair few hills on the Cheeky Walks, but this was the steepest of them all. But we did it bravely and without complaint. We followed the trail back to the start of the walk and then to the car. 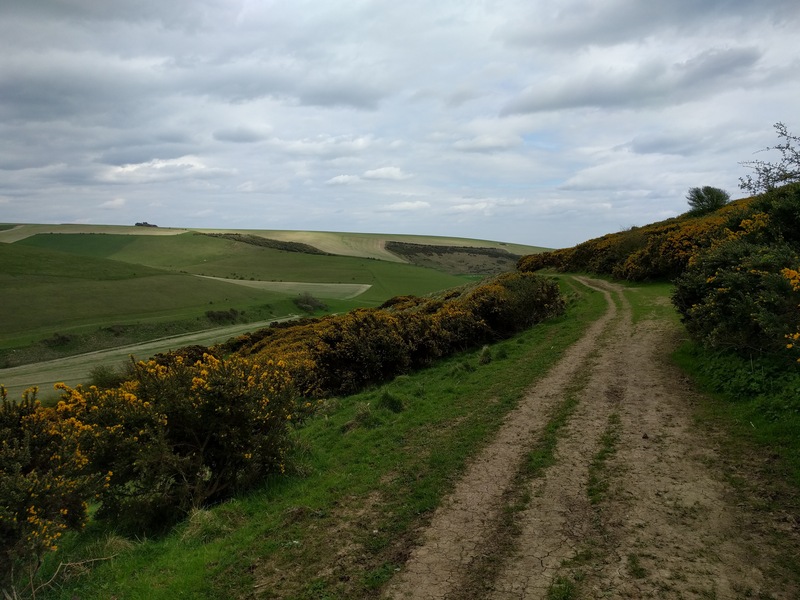 I think this hidden valley is one of the most beautiful places I’ve seen in Brighton. I can’t believe we passed so few other people as we walked through it. Had everyone found better things to do? I’d wasted so many weekends when I could have come out here.